Premier Mahinda Rajapaksa told Ceylon Today that Speaker Karu Jayasuriya has added a black mark to the supremacy of Parliament yesterday (14). He added that he condemns the act of the Speaker. 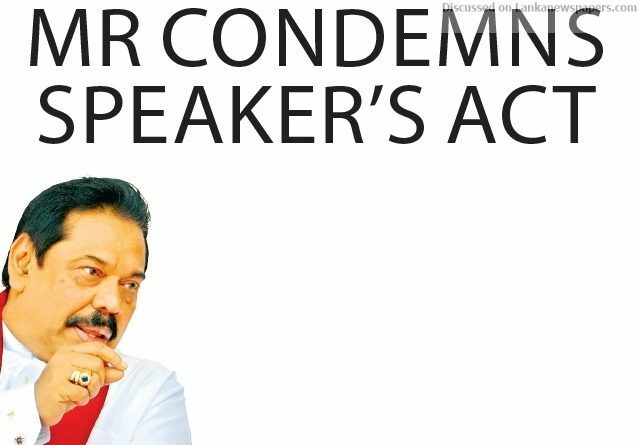 He further said that no one who respects democracy would agree with the act of Speaker Jayasuriya, who is disregarding the Standing Orders. He alleged that Speaker Jayasuriya is not acting upon the Parliamentary agenda, but in accordance with the whims and fancies of the United National Party. He went on to say that it is not appropriate for the Speaker to dance to the tune of the Opposition by totally disregarding the views expressed by the Government. He further said that it is hilarious to issue statements by not taking up for debate the No Faith Motion hurriedly brought against the Government in contrary to the Standing Orders of the Parliament, by suspending them. The Premier added that he attempted to speak up on several occasions, but the Speaker did not allow him to express his views. He further said that the Speaker acted in a manner akin to an autocrat by not letting any of the Members of the Government to express their views. He also said that this is against the Standing Orders of the Parliament as well as the conventions of the House. Rajapaksa stressed that although the Speaker acted in an undemocratic manner neither he nor any force that turns up against the country will be allowed to let down the mandate of people.